Jenna Lau reveals the secrets of Nushu, a language emblematic of Chinese female empowerment and sisterhood. History is rife with accounts of gender inequality and discrimination, be it through politics, economics, or education. Nonetheless, in the face of scarce educational opportunities, women have risen to create their own opportunities when learning languages. 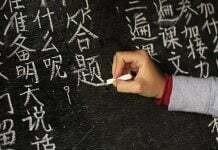 Originating from a remote county in the southern region of China during the fifteenth century, a writing system known as Nushu (simplified: 女书; traditional: 女書; pinyin: Nǚshū ) was used exclusively by women, who were forbidden from any form of education. Women in Japan encountered a similar situation. Denied the same language education opportunities as men, women were forced to come up with Hiragana (Kanji: 平仮名;Hiragana: ひらがな), one of Japan’s four writing systems and derived from Chinese characters.Insight into the creation and application of Nushu and Hiragana sheds light on the integral, yet under-reported role of women in the creation of languages and their influence on education. With their feet bound and on the brink of illiteracy, women developed Nushu, a writing system practiced in secrecy for hundreds of years in the region of the Jiangyong Prefecture (simplified: 江永县; traditional: 江永縣; pinyin: Jiāngyǒng Xiàn) in China’s Hunan province. Nushu, written as 女书 or 女書 in simplified and traditional Chinese respectively, translates to “women’s script.” The exact time of Nushu’s conception is still unknown, but it is thought to have been created sometime between the ninth and thirteenth centuries, with the language reaching its peak during the Qing Dynasty (1644 – 1911). The Nushu script was analogous to its traditional Chinese script origin, known as Hanzi (simplified: 汉字; traditional: 漢字; pinyin: hànzì), yet quite distinct in its appearance and usage. Nushu often borrowed characters from Hanzi, such as sun, written as 日 (pinyin: rì) or eye 眼 (pinyin: yǎn). Both scripts were written and read from top to bottom and right to left. However, Nushu script illustrates a thinner and elongated cursive style in comparison. Unlike the traditional Chinese characters, displaying semantic value, Nushu characters were simply phonetic. In addition, between six hundred and seven hundred characters were present in the Nushu language, while the average Chinese individual uses roughly eight thousand characters today. The Nushu language not only affected the method by which Chinese women communicated, but their culture and bonds. Emblematic of Chinese female empowerment and sisterhood, Nushu provided a sense of community amongst women. The language provided women an escape from their isolated lives, especially during marriage, when women left their families to live with their husbands, allowing them to express their deepest feelings with close female friends. Because this language was solely used by Chinese women, Nushu prevented prying eyes, especially those of men. Through writing, speaking, as well as singing, these women were able to express their feelings of hardship and domestic oppression resulting from the patriarchal climate (See). The last known proficient writer and speaker of the Nushu language, Yang Huanyi, stated, “Women needed a spiritual life. They could not write Chinese, but they wanted to express their feelings” (Yang). Nushu works were often created in the form of books, poems, and song lyrics. They were even embroidered in cloths, clothing, and paper fans. On the third day of a woman’s marriage, mothers and close friends provided the newlywed with a booklet (See). Because married life for Chinese women at this time was often characterized by oppression and isolation, the booklets contained songs, written in Nushu, expressing their sadness of the newlywed’s absence and loss of friendship (Yang). They also wished the newlywed a better and brighter future. Forming a bond between women, Nushu was passed down from generation to generation by mothers and grandmothers. Over time, the Nushu language gradually spread. One of the many reforms of China’s Cultural Revolution in the 1960s and 70s was that women were finally offered an education. Soon afterwards, rumors spread that Nushu was being used by foreign spies so Chinese women stopped using it. The language died with Yang Huanyi at the age of 98, the last known proficient speaker and writer of the Nushu language, on September 20th, 2004. Nevertheless, the legacy of the language lives on today. Collected and published by Qinghua University linguists, Yang’s poems and letters were preserved for posterity. The Hunan Provincial Museum is also dedicated to preserving and displaying the original works written in Nushu, including poems, letters, and books. In addition, a documentary by Yue-Qing Yang, Nu Shu: A Hidden Language of Women in China , follows Yang Huanyi to her hometown, learning about her life and background as the last Nushu speaker (Yang). Lisa See, an American writer and novelist, also documents Nushu’s background and its use in the nineteenth century in her novel, Snow Flower and the Secret Fan (See). Nearly two thousand miles across the East China Sea, Japanese women faced a similar situation. The Japanese did not have a writing system until the introduction of Kanji by the Chinese during 500 C.E. Use of this writing system was perceived to be indicative of a higher, elitist class and culture, as traditional Chinese characters were reserved for the upper class. Some Japanese men were offered the chance to learn Kanji but women were denied any such opportunity. Kanji was known as “男手” (Hiragana おとこで; romaji: otokode), literally translating to “man’s hand.” This gender-based segregation of education and literacy led women to develop a new writing system called Hiragana, which was considerd to be the language of the lower classes. Hiragana was originally referred to as “女手” (hiragana: おんなで; romaji: onnade), literally translating to “woman’s hand.” The writing system was used by women for poems, love letters, and private correspondences. It was later used during the Heian era (795-1192 C.E.) to create one of the first novels in the world, The Tale of Genji (Kanji: 源氏物語; Hiragana: げんじものがたり; Romaji: Genji Monogatari), by a famous poet and novelist of the Japanese imperial court named Lady Murasaki Shikibu (Kanji: 紫式部; Hiragana: むらさきしきぶ ). Along with Japan’s three writing systems, Kanji, Katakana, and romaji, the Hiragana script was considered the “ordinary syllabic script.” This writing system is characterized by cursive strokes and shapes, and is frequently used to write native Japanese words. The Japanese writing system evolved from an ideographic one, with its Kanji characters representing ideas and sounds, to sonographic, Hiragana representing phonetic values. Inspired by the curves of Chinese calligraphy, the Hiragana writing system followed suit. With 46 characters, the Hiragana system is a syllabary, a phonetic writing system with each Hiragana representing one syllable. Each character of the Chinese writing system represented a morpheme, the smallest unit of grammar or syntax; however, this did not properly fit with the Japanese language because of its mixture of various suffixes and the use of particles with specific words or clauses. To accommodate the complex Japanese grammar, certain Kanji characters were used for their phonetic value. However, it was difficult convey the Japanese language with only Kanj, so the writing system became an amalgamation of Japanese Hiragana and Katakana with Kanji characters. Each Hiragana became a syllabogram, a symbol representing one syllable, and each Kanji character was used as a logogram, representing a word or phrase (Koichi). The relationship between Japanese Hiragana and Kanji can be found between the juxtaposition of the two scripts: For example, the Chinese character 加 (pinyin: jiā), meaning “increase” or “add to”, inspired the style of the Hiragana character か, with a phonetic value of “ka.” Moreover, the Hiragana て (romaji: te) was derived by the Chinese character 天 (pinyin: tiān), meaning “heaven” because of their similarities in appearance and sound. child’s school” can be written in various ways. Using Kanji and Hiragana, it is written as “子供 の学校” or “こどものがっこう” (romaji: Kodomo no gakkō), using solely Hiragana. The Japanese try to use Kanji as much as possible, however, when the Kanji for a specific word is unknown, it is usually written in Hiragana or Katakana (Koichi). Because certain Kanji can be difficult to identify, Hiragana is also used to detail the pronunciation of Kanji characters, known as furigana. For instance, the word “telephone” is written as “電話” in Kanji. Each Kanji can be pronounced with one or more Hiragana syllables: 電 has furigana of でん (romaji: den) while that of the second Kanji, 話, is わ (romaji: wa). Together, the word for “telephone” is pronounced as でんわ (romaji: denwa). 音読み (Hiragana: おんよみ; romaji: onyomi), the Chinese reading of Kanji, means “sound reading”, and is written in Katakana, mimicking the original sounds of the Kanji within the Chinese language. On the other hand, the Japanese reading of Kanji is known as 訓読み (Hiragana: くんよみ; romaji: kunyomi) and is used to make the Japanese language more compatible with Kanji. For example, the Kanji for mountain, 山, has an onyomi reading of さん (romaji: san), similar in sound to the Chinese pronunciation, “shān” (pinyin). Meanwhile, its kunyomi, the Japanese pronunciation of the Kanji, is やま (romaji: yama). In contrast to Kanji, which are used to convey nouns and root meanings of verbs and adjectives, Hiragana characters are prominently used for grammatical purposes: conjugations, particles, and even special Japanese words. For example, the Hiragana の (romaji: no) is a possessive particle: the phrase “わたしのまち” (romaji: watashi no machi), written in Hiragana, translates to “my town.” The Japanese language is filled with many other Hiragana particles, such as で (romaji: de) or に (romaji: ni) to indicate an object’s location, and か (romaji: ka), which is placed at the end of a sentence to form a question. Over time, gender inequality in Japanese language education dissipated. Today, Hiragana is now a part of the official Japanese language, used by over a hundred million people around the world every day. With one language disappearing every fourteen days, the fate of the earth’s diverse catalogue of languages faces a rocky future. However, the lifecycle of China’s Nushu and Japan’s Hiragana provides a glimpse of their difficult beginnings and introductions to patriarchal societies. Their influences on modern society are forever engraved within the captivating history of linguistics and female empowerment. These stories of women and their increasing role in language education serve to inspire the world, both in the present and the future. See, Lisa. Snow Flower and the Secret Fan . Bloomsbury Publishing, 2014. Yang, Yue-Qing, director. Nu Shu: A Hidden Language of Women in China . Women Make Movies, 1999.